Sign up for the Biological Oceanography in the Caribbean taught by Dr. Medina over the winter! The Biological Oceabography course will be offered in Spring 2020. We have compiled an informative brochure about the course that you can browse here for more details. If you would like to apply for the course, please submit your form by accessing the following link. There are still a few more spots! This entry was posted in News on March 22, 2019 by Ana María González Angel. 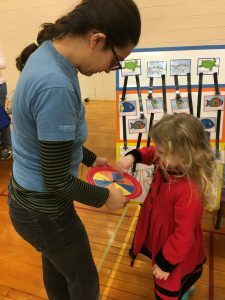 Sofia is in the Penn State news! 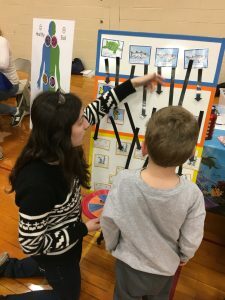 Indeed, Sofia’s hard work starting the SACNAS (Society for Advancement of Chicanos/Hispanics and Native Americans in Science) chapter at Penn State was recently featured in the Penn State news! Congratulations, Sofia! This entry was posted in News on February 11, 2019 by Ana María González Angel. The trailer for Saving Atlantis is out! Please visit the link to the documentary trailer, Saving Atlantis! We have a collaborative effort with scientists at Oregon State University and they have a wonderful team that made this documentary featuring our work. We hope you enjoy the documentary as much as we do! This entry was posted in News on January 28, 2019 by Ana María González Angel. Early release of our review! The review paper entitled “Multiple Facets of Marine Invertebrate Conservation Genomics” in which our former lab member Bishoy, and Monica are coauthors got an early online release! Visit our Publications page for more details and access to the paper! This entry was posted in News on December 4, 2018 by Ana María González Angel. Our former lab members Joe and Styles, and Mónica are coauthors in the article entitled “Coral-associated bacteria demonstrate phylosymbiosis and cophylogeny”, which was published last week in Nature Communications. The paper highlights the vast diversity of bacteria and archaeal communities in different coral compartments; and their coevolution with the host in a wide array of species. Visit our publications list for more! This entry was posted in News on November 27, 2018 by Ana María González Angel. A new article about Varadero is out! However, this one is not focused on the science we study but something else: “Saving Atlantis”, the documentary about Varadero reef, has been recently featured locally in Colombia. This is the story of that experience and we invite you to check it out! This entry was posted in News on September 14, 2018 by Ana María González Angel. Recently, our study reef, Varadero reef in Cartagena, Colombia was featured in the Penn State News. The note, with interviews and background info highlights the importance of this reef. We invite you to read the article about the Buried Treasure! This entry was posted in News on July 6, 2018 by Ana María González Angel. 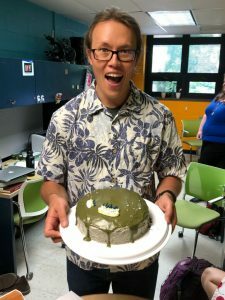 Aki had a successful PhD dissertation defense yesterday! We celebrated him with a Cassiopea-inspired cake and two crowded parties. Congratulations, Dr. Ohdera! This entry was posted in News on May 30, 2018 by Ana María González Angel. We welcome Dr. Allison Kerwin! Dr. Allison Kerwin recently joined us in the Medina Lab in a postdoctoral researcher position. Allison got her PhD working under Spencer Nyholm’s lab at the University of Connecticut studying the ANG reproductive system symbiosis in Hawaiian bobtail squid. Allison will be using her expertise in next generation sequencing analysis and microscopy in the Global Coral Microbiome Project (GCMP), and will start her contributions by attending the Dimensions of Biodiversity Data Management Workshop at the University of Florida Informatics Institute next week. We are happy to have her in our team and we look forward to working together! This entry was posted in News on December 8, 2017 by Ana María González Angel. 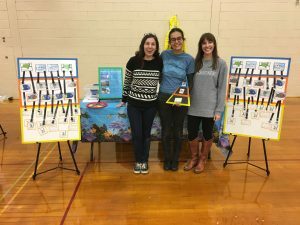 Our lab members Sofia and Ana joined fellow grad student Kathryn Stankiewicz in an outreach activity the group designed this fall called “Tangled up in the food web”. 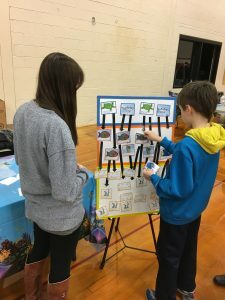 This activity aims to teach children how organisms interact in a toy marine trophic pyramid over a succession of beneficial and/or detrimental situations. The group was among several other groups from Penn State University that were hosted by the Exploration U 2017, Bellefonte edition. Lots of families and children joined us!! Pictures are courtesy of Allison M. Lewis. This entry was posted in News on December 4, 2017 by Ana María González Angel.